Dating to the 1930s or early 1940s, this English trio is simply very pretty. The elegant pattern of entirely hand painted pink blue and yellow flowers, makes this tea set really stand out, whether on the tea table or on display. It is definitely a very stylish trio that is very typical of the 1930s and 1940s in style - perfect if you have a home from this era, or if its a period that you love and you wish to bring a touch of 1930s /1940s style to your home! The pattern is so understatedly stylish and is most likely would have been intended as everyday teatime china in a normal family home. This does not, however, mean it is poor quality. In fact, it is lovely quality. The flowers and foliage decoration is all entirely painted by hand. 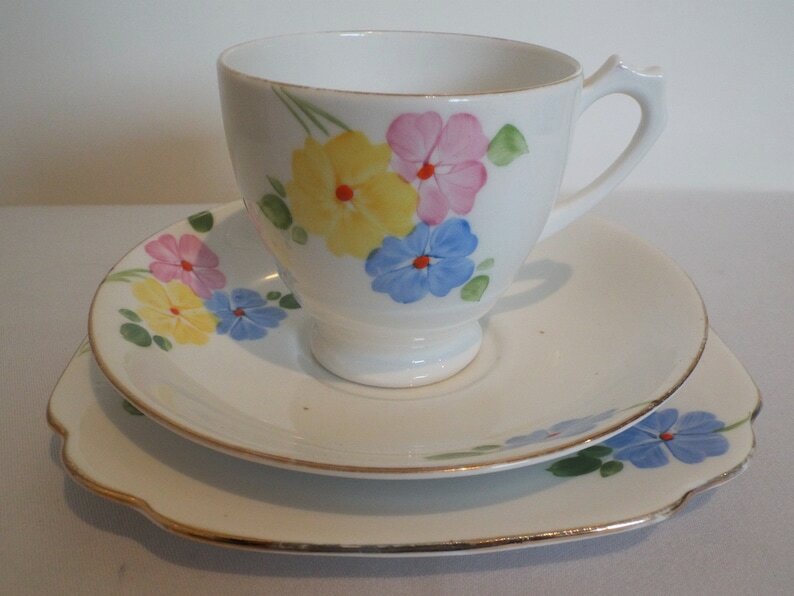 The teacup shape is quintessentially later 1930s and into the 1940s in style. There is no maker's mark, but a crown and the words 'Made In England' is stamped underneath every element of this trio and the hand painted pattern number '8726' is hand painted underneath the base of the teacup. In very good vintage condition. There are no chips, cracks or crazing to the glaze. The hand painted pattern is in lovely condition. There is wear to the rim gilding in places, which is perfectly commensurate with age and use. There is the odd little tiny fleck in the china in isolated spots, this is a natural occurrence of the contemporary manufacturing process at the time and reflects the trio's history. Any further wear or marks are commensurate with age. Please just ask for further photos. Your item comes with FREE PRETTY GIFT WRAPPING, consisting of vintage style brown paper and ribbon.